Trouble Uploading Photos in .HEIC format? Here's how to make sure these get converted back to a compatible .JPG to upload photos in Spectora. In iOS 11, the iPhone camera will save its photos in HEIC format, and videos in HVEC (h.265) format. The main advantage of these new formats is that the file size is way smaller, which translates to less storage space required on your phone, and faster syncing of your iCloud Photo Library. But right now, HEIC isn’t as compatible as JPGs. JPGs work everywhere. Every app can open them, cameras save JPGs, and they just work. Spectora does not currently support .HEIC file uploads, so here is how to make sure you get those photos as JPGs. 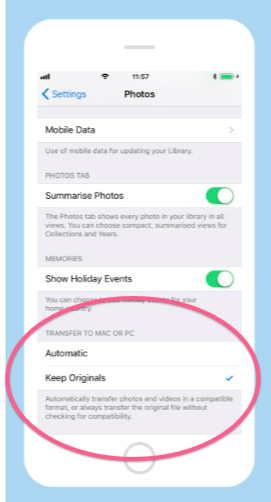 On your phone or IOS device, go to your Settings> Photos > Select Automatic.